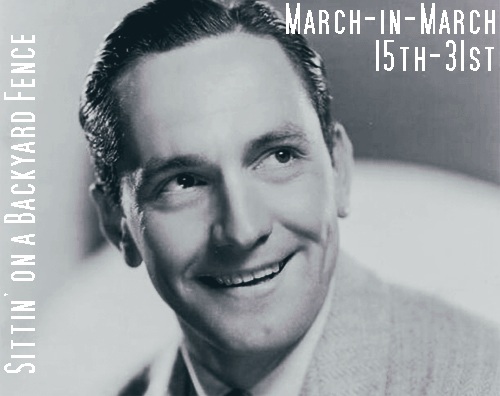 First of all, my contribution to “March-in-March,” the wonderful tribute to Fredric March hosted by Sittin’ on a Backyard Fence, has been posted! I’ve taken a look back at 1942’s I Married a Witch, in which March notoriously clashed–on screen and off–with temperamental costar Veronica Lake. Make sure to check out ALL of the great entries that have been posted at the Fence throughout the month! Secondly, we want to extend our sincere thanks to all of our readers and subscribers for helping us reach an amazing milestone today–300,000 page views! This calls for a celebratory happy dance. And finally, I know I said I would be posting entries in our ongoing “Women in Hollywood” series this month … well, March has gotten away from me (this is, unfortunately, nothing new), but I’ll have a couple of posts up later this week before the month winds down to a close. Look for the first one to go up either tomorrow or Thursday, and another on Saturday (as part of our “Pioneers in Animation” series!). ← A classic time in Atlanta. I saw I Married a Witch for Halloween last year and loved it! Congrats on the page views, I’m one of those 300,000 hits I’m sure!